"The holidays are a perfect time of year to spend some time baking cookies as a family. Featuring fun shapes and decorative icing, these Christmas cookies will be a hit at home or your next holiday party." Preheat oven to 375 degrees F. Line a cookie sheet with Reynolds(R) Parchment Paper, set aside. Beat butter and sugar until fluffy with an electric mixer. Mix in egg and lemon extract until well blended. Combine flour, baking powder and salt in a separate bowl. Gradually beat flour mixture into butter mixture until smooth. Divide dough in half; shape into 2 flat disks. Wrap dough in parchment paper; refrigerate 1 hour until firm enough to roll. Roll out the dough 1/8-inch thick between two sheets of lightly floured parchment paper. 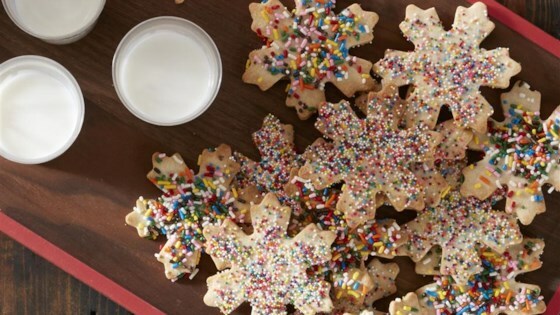 Cut dough with 2 to 6-inch snowflake cookie cutters. Place cookies 1-inch apart on parchment-lined cookie sheet. Decorate with colored sprinkles. Get tips for making classic cut-out cookies. For extra lemon flavor, substitute lemon juice for milk when making the icing. For snowflakes that slide right off, line your cookie sheet with Reynolds® Parchment Paper.